Pete and Jen met at the University of Massachusetts in Amherst, where Jen was in the nutrition program. She had grown up in New Jersey, was a vegetarian since she was twelve, and was dealing with some personal health issues. 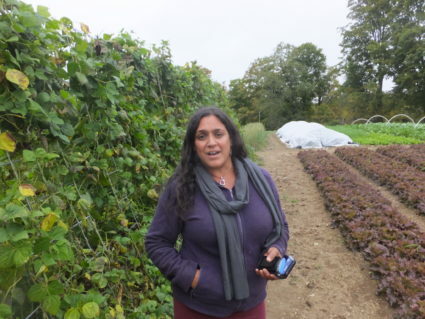 One summer she interned with Seeds of Solidarity Farm in Orange, Massachusetts and had her eyes opened to the truth about food being our best medicine. She also learned that how that food is grown matters very much. Pete and Jen met in college and he took her home to his family’s garden. She’d never experienced anything like that before. The most she had seen was an aunt and uncle in Brooklyn who grew tomatoes. So they began to inspire each other about growing. Upon graduation the couple rented Pete’s grandfather’s old house in Lee and began looking for land to farm. Jen did design installation and maintenance for her own landscaping company, and Pete worked at a local nursery and orchard. While they were looking, however, they figured they might as well farm where they were in Lee. Pretty soon they had two kids, a small CSA, and were full time farmers! Where they ended up turned out to be in Tyringham, just 7 miles from Lee. Four years ago they found land there they were able to buy and build a house on, next to a field they could lease. Of those ten original CSA families, nine are still with them and just one moved away. They now have 75 households as members. 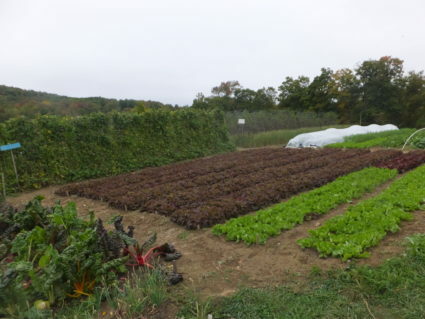 About 50 percent of their food goes to the CSA, and 50 percent is sold wholesale. The biggest constraint on the Salinettis’ farming operation has been their lack of enough land. Pete’s family land in Lee allowed them to have only about an acre and a half in production with nowhere to expand. They still farm it now, however. Although it is a hassle to farm in two locations, there are reasons to do so. For one, they’ve been working the soil for 16 years now and have really built it up. In addition, being right next to Lee Lime they never had to add limestone to make the land less acidic. The land there was heavily clay, initially, and the only thing that would germinate for them was beans. But by the time they moved away they were growing carrots in Lee. On their Tyringham land there is a clay component, but there is also sand, depending on where you are in the field — the lower parts have heavier soil, the upper parts are sandier. Jen stands by pole beans which are climbing sections of cattle fencing tied together to make a tent-like growing frame. This is also used for cherry tomatoes and other climbing crops. Right now all told the couple has about 5 and a half acres under cultivation. But even though they are at 1700 feet of elevation, however, they try to extend that acreage by a rapid succession of crops. Jen figures that five and a half acres is equal to about 17 acres when you calculate the multiple successions they take pains to maintain throughout the season. The couple hopes eventually to be able to lease or buy more land, however. Both Pete and Jen share the concern about raising the highest quality vegetables possible. To them, a key part of that is to raise their crops without tillage. Diego uses scuffle hoe on newly seeded bed. Note how flat and perfect the bed is. In a month a new, 20 by 50 foot greenhouse will go up here. Eliot Coleman helped encourage them in this direction. They took an intensive course with him at a NOFA conference a while back. Instead of tilling, the Salinettis have found other solutions for the problems tillage is supposed to solve. Pete shows his six-row seeder. It can plant from one to six rows at a time, at four different speeds and with 4 options as to seed size, The seeder itself is about 15 inches wide and has front and rear rollers which flatten the bed before and after the seed is planted. In this shot the hopper cover is removed to see the inner works better. The solarization is done with greenhouse plastic. Pete monitors the top 4 inches of the soil for temperature. How long he leaves the plastic down depends on the weather, sometimes snow is an issue. He likes to achieve at least 45˚F soil temperature at 4 inches down before putting seeds in the ground. That way he can get those seeds to germinate. It may take a week to ten days to bring it up to that, but once they germinate he figures they are going to go on growing when they are ready to. He doesn’t do anything after that. “The other thing that we do,” Pete says, “in terms of weeds, is stale bedding. We’ll prep beds and irrigate them to get the weeds to germinate. Then we go through with a flame weeder to flame those off, seed our crop (something like carrots will take 5 to 8 days) and go through with a flame weeder again to eliminate the weed problem just before the crop starts to grow. This is hard in the spring because the soil temperature is low, but in summer months we do it a lot. The couple often kills sod and opens up a field to vegetables by laying down cardboard and mulch and applying compost to the cardboard area. The following year that field will be workable. Lettuces in center of field are a major crop for Woven Roots, and show the care with which they lay out their beds and plantings. Jen gave Pete a broad fork as a gift when they were in their twenties. They have four of them now and only use them to aerate, never turn the soil. But they do that aeration religiously, before every planting. They use an 18 inch model and go up one side of the 30-inch row and down the other, every six inches. Jen wants to increase their efforts to build soil carbon in the future. Once they have more land she would love to establish a collaborative effort with an animal farmer, for instance, and points out they bring manure in right now to make compost and being able to get into more of a rotational system with animals would be great for everyone. One of the ways the Salinettis seem most Eliot Coleman-like is their thoughtful planning of intensive rotations and successions. “Every spring,” explains Pete, “I plan out where the crops will be and the successions. Of course things move and it depends on the weather and other things. But roughly we have the plan. There are tricky ones, like the tomatoes. All you can really get in before tomatoes is a bunch of radishes or some lettuce. You have a June planting and a week to prep it, so there are tricky ones. It also depends on how long you want to keep existing crops in the ground. We ripped out eggplant three weeks ago so I could get fall seeds in the ground and a new crop out of that piece of soil. We could have kept the eggplants going, but it wasn’t really worth the dollar value for what was in there. A better use of space is to rip them out, give whatever is left to the CSA, and plant it with a fall crop that will produce us some more income. “I will roughly put it all down,” he continues. “Like, I need this land for storage carrots on June 15, what can I do before that? Something that will be out of the ground in time for us to re-prep for the carrots. It is all fluid. We try to think of it as taking care of your land as best you can. Therefore we are getting that much more production out of it. We’re not letting the weeds come in, for instance. We don’t have the down time between harvest and next year. I’m carefully calculating how long a crop needs to be in the soil and being prepared for that soil to receive a transplant or seeds as soon as a crop is done. “We focus very highly on plant spacing,” Pete concludes, “and how close you can plant and still maintain optimal health. So that and we are getting 2, 3 maybe 4 crops per bed per season. That was the only reason we were able to make anything off a piece of land as small as we had in Lee. Ideally, I feel that where we are now, which is about 5 acres open in field production, supporting a crew of four full time people plus the two of us, working throughout the season just at that size can work. We try to grow just a little bit each year because we like to maintain an intense, weed-free operation. It is hard to say how much land would be ideal, or if that would change the way we do things if we got much bigger. When it comes to bed preparation the couple tries to leave as much root matter in the ground as possible. When they harvest lettuce, for instance, they twist them out just enough to get the knuckle so it doesn’t regrow and leave as many plant roots in the soil to decompose as possible. They figure that’s better than putting them in the compost and then putting them back in the ground. They get compost from New England Harvest as well as making some. The recipe is to use a 5 gallon bucket every 8 running feet of bed, just shaken on by hand. That amounts to 5 gallons of compost every 20 square feet, applied every time a bed is planted. So it can be once, twice, three of even four times a year. The one thing Pete is passionate about is that to have consistent germination you have to have flat beds. The reason Pete stresses the bed’s flatness is that he uses a hand seeder – his is a 6-row one – which makes for really tight spacing. For that 6-hopper setup he feels you really need a clean, smooth surface. The seeder drops the seed at the proper depth but if you have humps or dips it will bury it too deep or not at all. The seeder itself was designed by Eliot Coleman and is distributed through Johnny’s Selected Seeds. It is about 15 inches wide and has front and rear rollers which flatten the bed before and after the seed is planted. The rear roller also, through a belt, drives a shaft with holes in it of 4 different sizes. The shaft can be moved sideways so that 6 holes of any particular size can line up with and take a seed from 6 seed hoppers. Any number of hoppers can be used to plant a bed, up to six. Jen holds a bouquet of radishes. In the background are farm beds with a crop of kale. In the far background are Jersey cows belonging to the neighbor running a dairy on land the Salinetti’s hope they might farm one day. 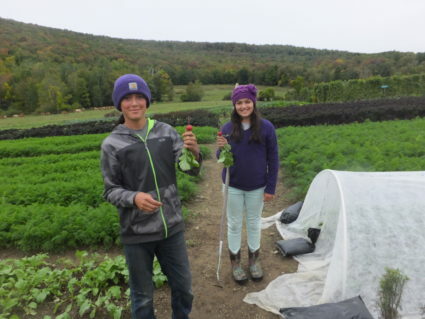 When raising seedlings each spring in Lee, Jen and Pete had a greenhouse with a hotbox in it. “That is a trench that is 4 feet deep into the ground by 32 feet long,” Jen says, “and we’d bring in fresh manure and lay it 18 inches deep. We’d let it break down for a couple of weeks and generate heat. Then we’d put pallets over that, and all of our plug trays. After the seedlings germinated indoors, we’d bring them into the hotbox and put insulation over the whole box at night. It would maintain a temperature of 60 to 65 degrees when it was zero outside. “We would come into the greenhouse in the morning,” says Pete, “turn the heat on to get it up to temperature, and uncover the seedlings. We started it in mid to late February. We plan on building that again, here. It was amazing. It cut back our use of heat tenfold. When planting seedlings, the couple finds that usually the soil is soft enough that they can just use a marking rake to set up a grid system and then make holes at the intersections with a finger or hand. 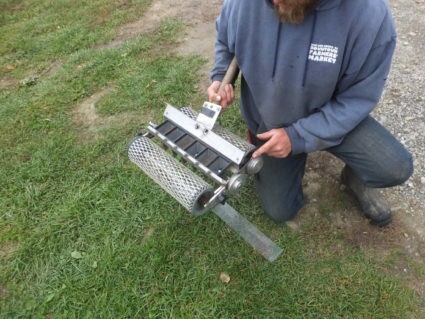 “The marking rake lets us set our teeth at the right distance apart,” says Pete, “so we can be consistent with our placements. We string lines to make sure the grid is straight. In some of our newer soil we may have to use a trowel, and for something like leeks we use a dibble to make sure we can bury them further into the soil. I wondered about exposing so much soil and compost to the air and asked if the pair ever used mulch. “We used to use mulch a lot,” Pete answers, “and on bigger crops we are getting back into that. But once we switched to tighter spacing and more succession in a season we found mulch to be almost a hindrance. You are constantly having to remove the mulch to re-prep the bed. We use it on tomatoes to some degree just to keep down the soil splash. But it is hard to find good mulch at a reasonable cost. And it is hard to find mulch materials that are seed free. I bought some last season that the guy swore was weed free. You should see the stand of weeds we have there now! “I’ve been using straw,” he continues. “Leaves are good, too — they are ideal. We chop them up with a mower of some sort, or compost them a little first until they are broken up. Mulch can be challenging because of our seeding system, but I’d really like to reincorporate more in our system again. It’s amazing to see what is going on right under that mulch as opposed to in bare soil — microbes and earthworms, tons of porosity, free fertilizer from the worms! When it comes to using cover crops, the couple struggles with trying to incorporate more cover crops into their practices. They haven’t figured out yet how to do that and still maintain their permanent bed system without using a tiller. They are adding a lot of compost, though, and feel that adds organic matter without cover cropping. “The reason we haven’t gotten there yet with cover crops,” Pete admits, “is that we need to have a little wiggle room with the amount of space we have and what we need to produce. Then we can put fields and beds into fallow and cover crop them for several seeding periods. But we haven’t worked this in because we are using land so intensively. One of the CSA members carved this 2-sided sign for the farm. It is made of cherry taken from the Salinetti’s land. It turned out to be so heavy that Pete and Jen are keeping it on their porch until they devise a sturdy way to hang it. 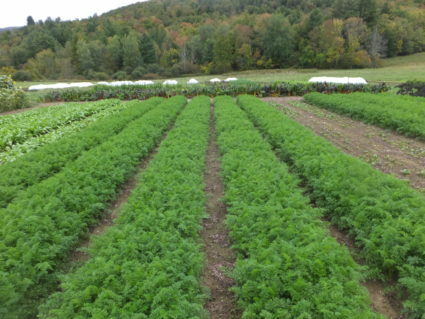 “Cover crops are one thing when you are talking broccoli and cabbages,” he continues, “which you can undersow. But if you see a field when it is finished there is no room for anything else, including weeds. We’re talking about clover in the walkways, but you have to beat back the clover that begins to creep into your bed each time you replant. How do you do that? Do you do it with a roller? Do you need to replant? Do you cut it with a shovel? I’m scared to create more labor. Both Jen and Pete feel that their growing practices have helped them considerably this year with the drought. They have more moisture in the soil than many area farmers because of their lack of tillage. The farm in Lee has been under no till for longer than the land in Tyringham and they can see the difference. But it is not as though they were able to ignore the lack of water! This year the irrigation water came from their strong well which has a 27 gallons a minute supply of water, but of course the pump was running most of the time and that is expensive. The couple has a border along a brook, but that was bone dry. They also have permission to draw water from a spring high on a nearby hill, which was running this summer, so perhaps that will be their irrigation in the future — gravity fed! Flea beetles are major pests for the Salinettis, who use low tunnels to protect their brassicas from the insects. 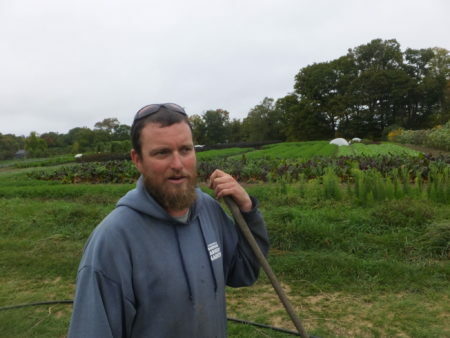 “We have collards, bok choi, mustards, arugula, and broccoli raab under tunnels right now,” says Pete. “It is more a precaution. We don’t know for sure they are going to be attacked, but if they are it’s hard to get the flea beetles off. They grow just as well under row cover as not. We often get foliar damage on their leaves when they are young, otherwise. Usually when they get to a certain size the growth chemicals change and we can uncover them. But at the beginning for a transplant of arugula, for instance, if we don’t cover them for the first 2 weeks they almost all get killed, they are so heavily fed on. One of the crops that have personal significance for Jen and Pete is beans. They raise some Italian pole beans that Pete’s great grandfather brought over from Italy and the family has been growing ever since. And they also have some Rwandan beans they brought back from a trip there 4 years ago. Sharing the farm work with the family are four employees, three of whom who worked there last year as well. “Most take on other work during the winter,” Jen says. “One does substitute teaching, another was a private tutor for a student in the school system so also was employed by the school, another picked up a job at the local package store. They find various things. Our youngest is an 18 year old and the oldest is in the mid 30s. We start them off at $10 an hour and our highest paid employee is at $14. Anticipating the next issue of The Natural Farmer which will feature stories about farm labor and a living wage I asked them how they felt about the idea of paying a $15 an hour wage. “None of us get paid that much,” Jen replied, “and we’ll be shut down if that is the law! It is terrifying, to tell you the truth. We have been trying to figure out, if there isn’t an exemption for farms, how we are going to stay in business? One of the real rewards that both Jen and Pete mention about their farming experience is the enthusiasm of their customers for their food. The Salinettis are planning a lot more improvements in their farming infrastructure as soon as they can afford them. One of the innovations they employ is making tents of sections of cattle fencing for beans and cherry tomatoes and climbing crops. “They’re galvanized so they don’t rust,” Pete notes. “Compared to stakes, with the price of new ones and the labor of taking them out and storing them, these are more efficient. One of these trellises can house 6 plants, so that is the same as six $3 stakes which last only a few years. On the program front, Jen and Pete are interested in doing more educating around their growing practices and how their choices around food have social impacts. They’d like their space to be a more welcoming one and to share it with artists, musicians, nutritionists, and other educators. They already conduct workshops and their CSA has events twice a month for children. Off farm they run a garden program at the Montessori school as well as an intensive at the local high school. 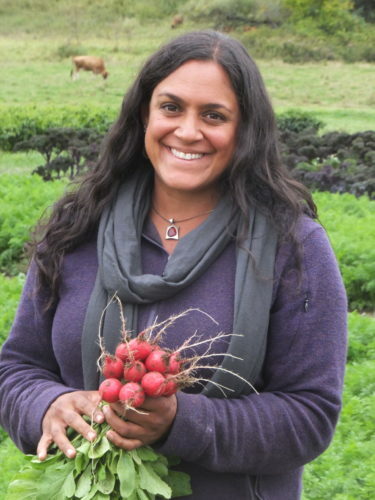 “In the long run we’d also like a barn housing an educational center, a commercial kitchen, a bakery for Noelia (who makes delicious pastries) and a farm stand. We have lots of ideas! It’s all fresh right now!